VATICAN CITY (CNS) — In a moving ceremony that recalled how Jesus loved the world so deeply that he lowered himself to serve and died for everyone’s sins, Pope Francis washed the feet of 12 prison inmates, plus a small toddler who lives with his incarcerated mother. “Jesus loved us, Jesus loves us, but without any limits, always, all the way to the end,” he said during the Holy Thursday Mass of the Lord’s Supper April 2. “He does not tire of loving anyone, he loves all of us” so much that he gave his life in order “to give life to us, for each one of us … for you, for you, for me, for them,” he said, pointing to the men and women inmates gathered in the “Our Father” chapel in Rome’s Rebibbia prison complex. The pope arrived at the prison to the cheers and shouts of hundreds of prisoners chanting “Francesco” and applauding as they stood along metal barricades lining a prison courtyard. After getting out of a blue four-door vehicle, the pope turned to a large concrete prison block behind him and waved, presumably because voices and cheers were coming from within the heavily barred windows. He greeted, hugged, clasped hands with and kissed the scores of inmates outside lining the barricade. Many held plastic rosaries out to be blessed; others wanted just to stroke his hand or ask him to pray for someone in a picture they showed him. Despite the solemnity during the opening procession of Mass, many could not contain their emotion and joy at seeing the pope and the congregation of 300 inmates, prison staff and volunteers broke out in applause and people leaned in close to touch the pope, congesting an already narrow center aisle. In his brief, off-the-cuff homily, the pope explained the meaning of the Lord’s Supper and the significance of Jesus washing his apostles’ feet. Back in Jesus’ era, he said, when people came to visit, their feet would be dirty from wearing sandals on dusty roads. “They didn’t have sampietrini cobblestones back then,” he said, as people smiled, recalling Rome’s signature lava stone-lined streets. 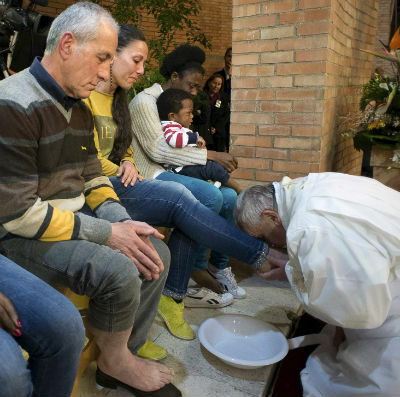 But instead of having a slave wash the apostles’ feet, Jesus performed the ritual himself to the apostles’ shock and incomprehension, the pope said. Jesus loved people so much, he said, that “he became a slave in order to serve us, heal us, cleanse us,” he said. He said the men and women who would participate in the foot washing ceremony would be representing everyone, all 2,100 people, housed in the detention facility. 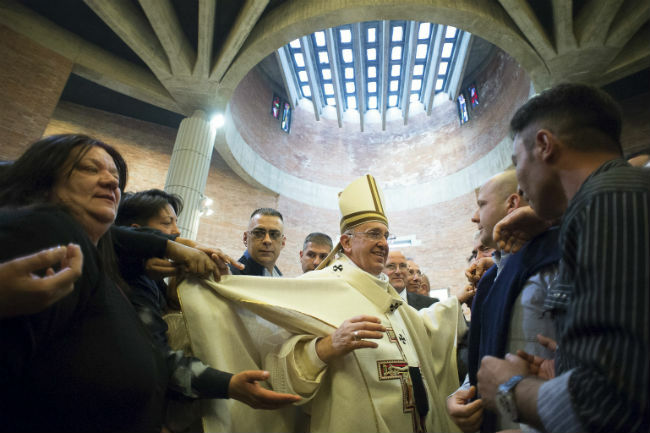 After his homily, the pope removed his vestments and put on a large white garment tied over his alb. He kneeled before each of the 12 detainees: most were Italian, others came from Nigeria, Congo, Ecuador and Brazil. Two aides assisted the 78-year-old pope in kneeling and pulling him back up. 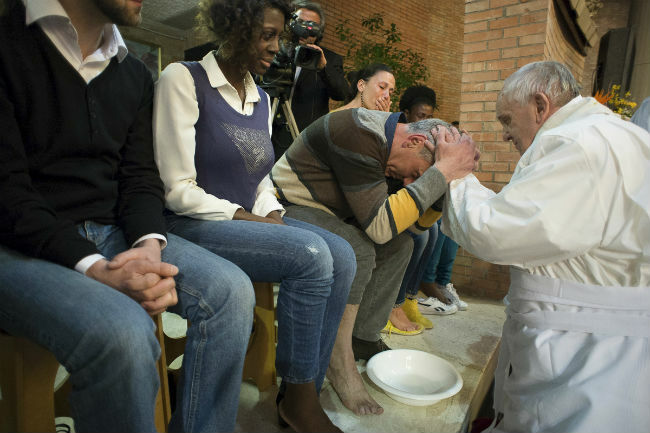 The pope poured water from a white plastic pitcher over each person’s foot, scrubbed it slowly with a white towel, bent low to kiss it and then looked up into the eyes of each person with a broad smile. The gentle and caring gestures brought many of the inmates to tears while children’s squeals and banter bounced off the tall brick walls of the chapel. Before washing the foot of a mother from Nigeria, the pope washed the tiny foot of her small boy, who calmly watched the proceedings from his mother’s lap. She was one of many female detainees at the Mass who live in the prison’s maternity section, which houses incarcerated mothers with their children who are younger than three. When the Mass ended, the pope patiently and happily made his way down the center aisle that had now become chocked with inmates eager for a hug and blessing. The pope’s guards, squeezed a few spots behind, appeared relaxed. As Holy Thursday and the Mass of the Lord’s Supper commemorate Jesus’ institution of the Eucharist and the priesthood, the pope continued a tradition he started by having lunch with a small group of priests from the Diocese of Rome.